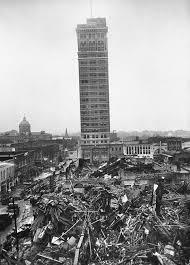 Waco, Texas, is the site of many interesting historical happenings, but one that locals still talk about is the F5 tornado which hit the downtown area on May 11, 1953. It is the 10th worst tornado in the nation. The irony was that an Indian legend held Waco was immune from tornadoes because of the surrounding bluffs of the Brazos River. Most of the locals believed the legend, and so were not alarmed when the weather began to deteriorate and throw the small city into eerie darkness. A geology professor at Baylor University did research on the situation after the fact and found that the opposite is true. Waco sits upon a geological formation which actually makes the town more vulnerable to deadly tornadoes. Through the years I've heard stories from two friends about the tornado that fateful day when 114 people lost their lives, 597 were injured, 600 houses destroyed, along with 1000 other buildings, and 2000 vehicles. One was a Baylor student who went his friends to the downtown area which was where the tornado hit to pull people out of the rubble. He tells of extricating bodies of those who perished as well as the injured. Another friend tells about her father who was on the upper floor of the medical buildings which was hit and rode the building as it fell and emerged unhurt. physicists from Baylor University took a Geiger counter and went to the ruins of the building to search for the dangerous object. They did find it in the rubble of the basement and took care of the problem. 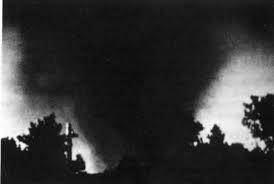 The destruction of the 1953 tornado in Waco was one of the primary factors in developing a nationwide severe warning system. We now live in Waco, and in the eight years we've been here I would say that every tornado season we do have several instances of tornado watches (conditions are favorable for a tornado), and of tornado warnings as well (tornadoes have been sighted -- take cover!). I have lived through one tornado, but it was not here in Waco, but in East Texas, north of Tyler. We were running a conference center at the time, and the twister hit the dorm, jumped over our house, and moved on. The devastation to the dorm was stunning ... bunk beds and mattresses thrown into the woods, but the hymn book was still sitting on the piano. We were grateful to God nobody was hurt. Have you ever experienced a tornado first hand? I would love to hear about it. Leave a comment below! Golden, that was my senior year in high school and I was devastated because I was to become a student at Baylor that fall. Evidence of the damage was still very much in evidence when I arrived on campus that fall. My senior year, spring of 1957, another tornado passed over the campus. I was in a home ec. class and they came and told us to evacuate and get to cover. I wasn't allowed to go back to Burleson, my dormitory, but went to the Union Building instead. We were in the basement where the old Baylor bookstore was and we were having cokes and laughing and talking when that roar came. I will never forget it. It didn't last long, but we were scared to pieces. When we were finally told we could leave. We found trees down and some damage to Old Main building. Burleson was fine as were most of the other buildings. We saw only minor damage to buildings and trees uprooted. Could have been so much worse.Things have changed a lot at Baylor through the years, but whenever I visit the Student Union Building, I remember that afternoon of the tornado. It is a scary thing to live through, isn't it, Martha? I would imagine people were a bit panicked during tornado season the years immediately following the 1953 event. My husband and I visited Waco about 7 years ago when I was doing research for a book. I didn't know about the tornado that had hit the town then. They did a good job of rebuilding. Hi Golden! What a horrible tornado! I can't imagine riding a building that's crashing down! Waco has become very familiar to many people now, thanks to Fixer Upper, one of my favorite shows. Do you know Chip and Joanna? Wonder if those silos were there when the storm hit? I forgot to mention that I have been very close to two tornadoes. One hit at night, just down the street from our house. Fortunately it was a small one, but our dog wouldn't stop barking at the time it hit, which was during a thunderstorm. The other one was during the day while I was in my car in Rome, GA. THe sky turned a light green, and I remember how unusual it was. I didn't know until later that a tornado struck a few miles away. I'm thankful God protected me at that time. Back in '95 we experienced what appeared to be a tornado when I looked out the window and saw the spruce trees bent over and broken branches and building materials sailing down the street, but since it merely sheared the top halves of the trees off, the official word is that it was a plow wind. No injuries, but garages moved, truckloads of debris, broken houses, etc. I was 7 months pregnant at the time and refused to climb down the steep steps into our creepy cellar in case I went into labour (I was high risk for premature delivery again). So, we huddled under a blanket in a windowless corner of our bedroom. We didn't realize until we went outside that on the other side of the room, and 6 feet from the wall, our huge tree split in two, and the broken half fell away from the house. Praise God! Tornados are terrifying to me. In 1982, it was being reported that a tornado was headed for our small town. I had a three week old and a four year old. We took shelter in an inside closet while my husband kept a watchful eye for the monster. Thankfully our little town was spared but a town up the road was not so fortunate. Lives were lost and the destruction was great. I remember that tornado, Golden, although I didn't live in Waco at the time. Everyone in Dallas was marveling at the path it took, straight up I-35. 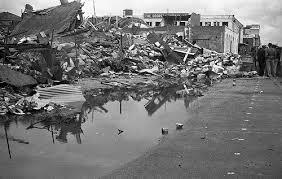 And we grieved for the losses the people of Waco sustained. It was the most talked about item in Dallas for at least a year. People whispered about it wiping Waco off the map. It didn't of course, but it must have seemed like it to those of us who were watching from a distance. Very scary! Since moving here (Waco) 10 years ago, we've had many tornado warnings, and some with damage, much of it high winds, but never anything like 1953. I did not know that 1953 tornado here was one of the mitigating factors for the development of the nationwide warning system. What is amazing is the resilience of people, with the strength God gives us to persevere through the storms of life.